This tree sits in the corner of the hallway next to the window on the second floor of my house. I had to purchase a bigger tree for my elf collection this year. 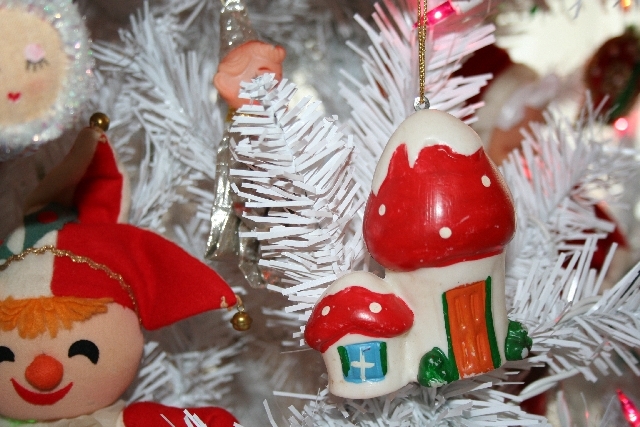 I love these fun, kitschy knee hugger elves. I have expanded this collection to include funky flocked ornies. Also I am always looking for the handmade felt ornies, the ones that someone so meticulously sat and stitched with embroidery and sequins! Mr georgiapeachez bought himself a new camera so these are my first pictures using it. Sweet! I only know how to use the auto and close up setting so far. I can’t wait to open those pretty packages under the tree. Those are all for me! from my BFF Beth. I know they are something really special! I also have some special ornies on here this year that are from my good friend Susan and from my blog friend Sadie Lou Who. It’s true, come December I revert to being 8 years old! My 16yo has been infected by my holiday decorating virus. We are starting her christmas ornie hope chest this year. I want her to be equipped and ready to decorate her own tree when she leaves home! I love this ornie. It is a ceramic egg that has been glazed and decorated. On the back it was signed in gold glaze "Pat ’75". I bought this in one of those grab bags of stuff that they always put together at the thrift store. I love those!! I get some of my best vintage ornies that way. The thrift store gets all this loose stuff donated so they just fill up a plastic bag with sort a kinda like items and put a crazy price on it. $1.98 or $2.97 or sometimes even $0.75!! It is worth it just to find 2 or 3 treasures in the bag. 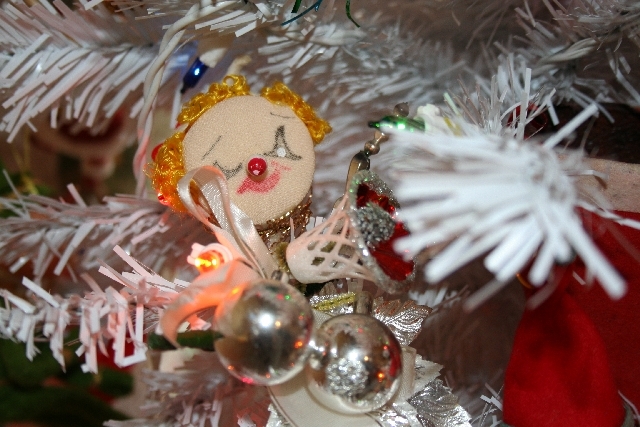 You are an inspiration for Christmas decorating! Wow! 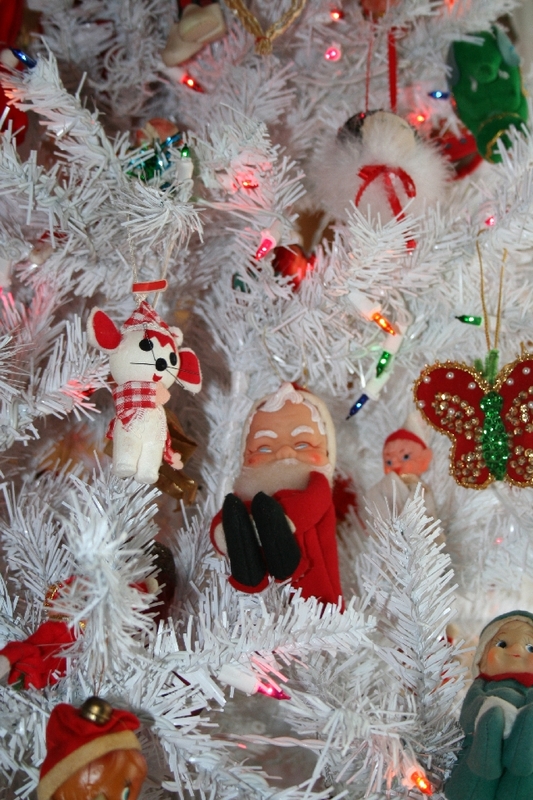 You have managed to collect so many vintage ornaments! I recognize the knee hugging “santa”! I have him too! He’s been in my family since the 50’s I think. He is so special that I don’t put him on my tree, he sits on a red shelf in my kitchen! Don’t you just love those thrift store grab bags? You sure do have a nice collection! I love those “grab bags” at the thrift store, too! Where can we find such a thrill of a find for under $2? Nice to get to play with a new camera! My Gosh you must have a lot of Storage Space! Lovin’ this elf tree. And your bff Beth is sure on top of her Christmas shopping, heh? Nice to meet you Suzy. 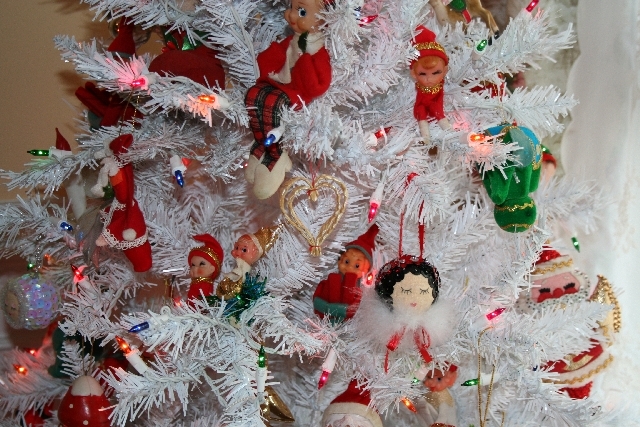 Oh my goodness… your elf tree has me recalling many Christmases ago, when my aunt and grandmother had ornaments like these on their trees… what a wonderful feeling of sentiment and cheer this evokes. Thank you! 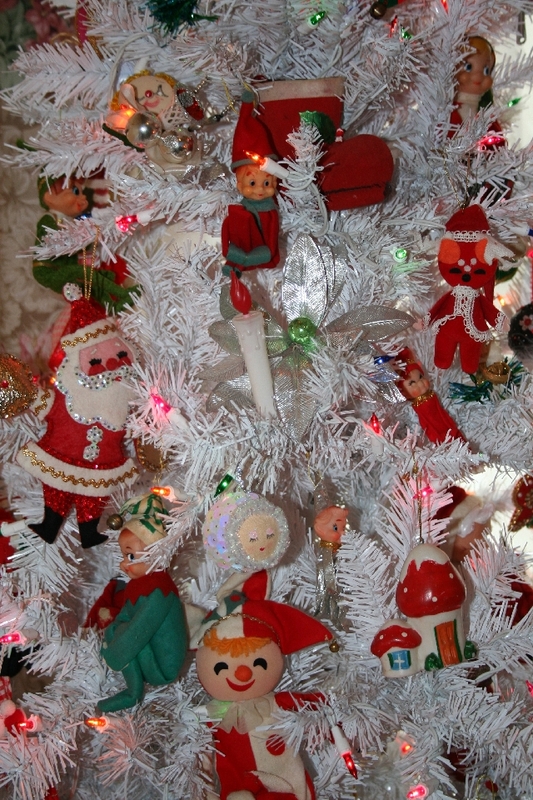 I am sooo in love with your elves and your adorable elf tree!! Wow. They remind me of some that we had growing up. Wow. What treasures those cutie elves are! Oh, I love your collection of ornaments. They’re so vintage looking. I feel a little nostalgia coming on. What a fun tree. What fun! I love the skating ornament. Your tree is just beautiful. oh my!! 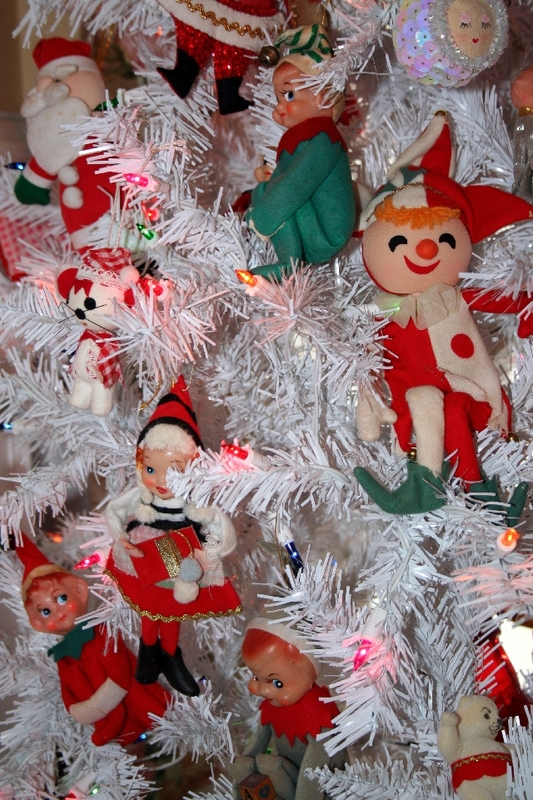 what a walk down memory lane…my grandmother collected little elves like the knee hugger ones pictured here. thanks for sharing your beautiful tree! I’m so glad you’ve given all those sweet little elves a pretty home where they can all live together happily- the tree is darling! I found a bunch of bags of ornaments like those as well as individual ones at Habitat For Humanity last week, but alas, I don’t celebrate Christmas so I didn’t buy them!! Next time I go, I’ll see if they’re still there and grab them for you if you want. WOW!! 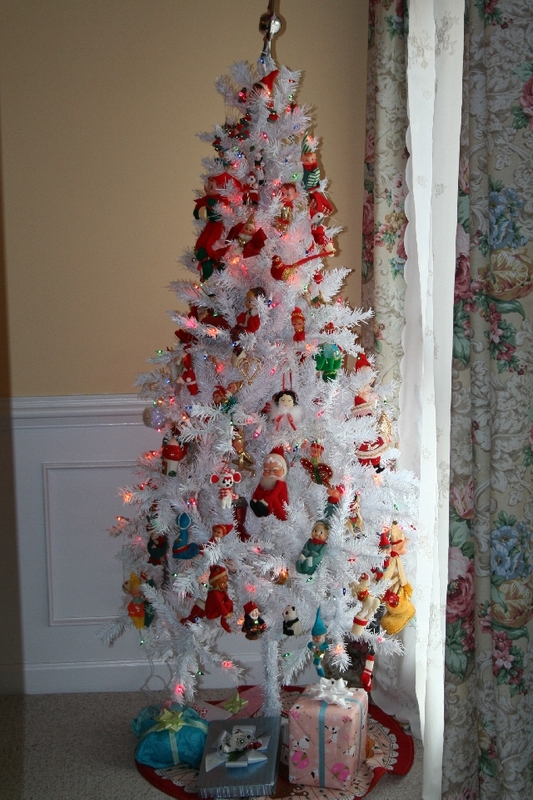 I feel very honored to have my creations in such a lovely and creative Christmas tree! Thanks so much for the shout out. I have to bookmark your blog, here. 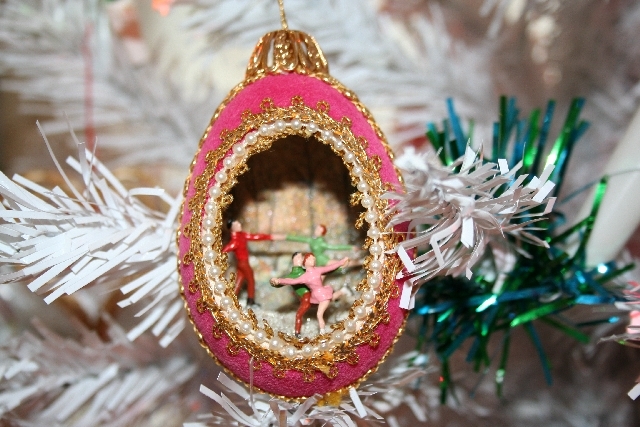 Did you get the Bitsy Betsy Ornaments from Heather’s show yet?? man! I love your elf tree! I only have a small one, but I love them so! Your wreaths are beautiful! Do you hot glue the balls? I am afraid that the heat would break them, but I guess not! Really love that square one! I just bought some big huge bags of christmas kitch at Goodwill and am making a wreath with them. Love your decorations- peaches! They are lovely!